This is a simple form of English botanical microscope is signed on the column: Dollond, London. It is focused by sliding the stage up and down on the rectangular column. 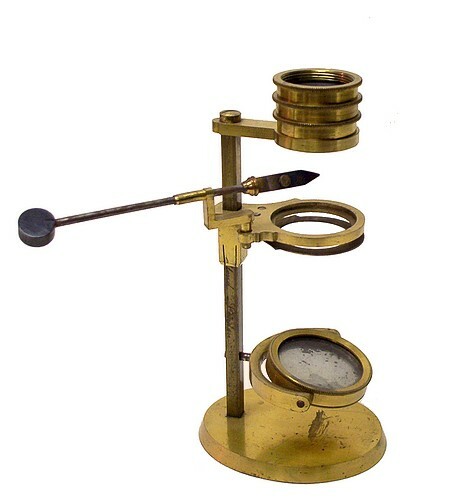 It is supplied with three screw-together objectives, which can be use singly or in combination to vary the magnification. Also included is a live box, ivory and glass stage inserts, a stage forceps, a hand forceps, two dissection tools with ivory handles, and three ivory specimen slides. 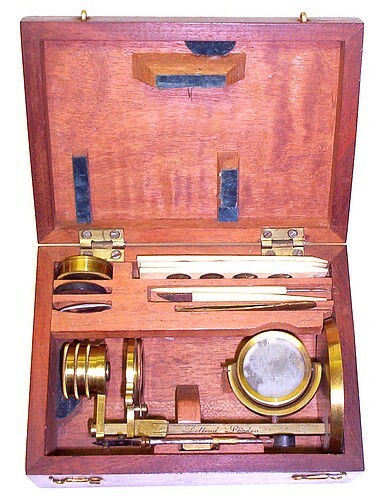 This is often referred to as a "Jones-type botanical microscope" on the basis of it having an oval shaped base.